Let me add a couple things. We are housing the boiler just "outside" the greenhouse. And the barrels we installed were dig 2 ft into the soil, and have black plastic housing them as well as a black roofing membrane on top of the to collect heat and we'll use that surface for our starts. Thanks again and enjoy your days! Hello all! Wondering if anyone has done this or feels they can speak on this approach we are considering. Our plan is to house a wood boiler that can heat water that is pumped through Pex tubing and back through a closed system. We are likely to lay the tubing down 12 inches and space it 18 inches apart. Tubing will likely be 5/8" to 3/4" diameter. My question isn't so much about our ability to run the system, but rather about its effectiveness as it is running. Will the heat that is produced reach the root systems of things like tomatoes? We do plan on laying some sort of insulation beneath the tubing to direct the heat where we want it. I would much rather lay it deep like this so that we don't have worry about hitting the lines as we work the soil. Also, we will incorporate a 300 gallon tank for storing the heat produced in the water as we circulate. We have already installed about fifty 55-gallon steel barrels on the inside perimeter of our 30'x72' high tunnel and filled them with water for insulation from outside soil temperatures, as well as to moderate temps inside the greenhouse. Bengali Pit / Dakota Fire Hole with thermal mass chimney - will it work? Funny, my task is also to heat the soil in a greenhouse over winter. Supposing that sunlight and collected heat wont be enough, especially over night? This ancient stove seems ideal, if we can make it work with the incomplete information that we have. 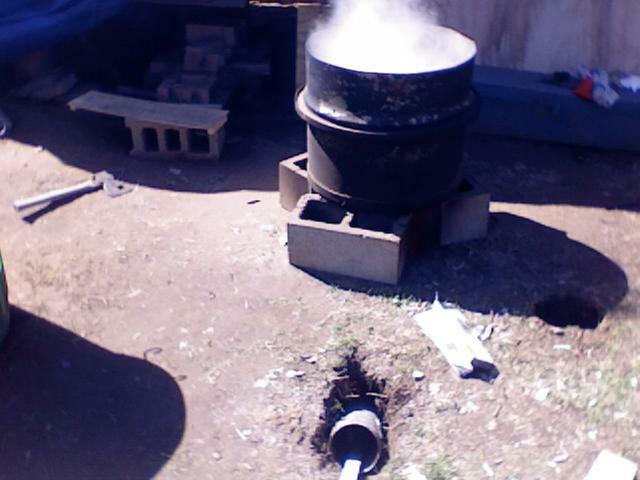 My understanding for the workings of a rocket stove is that the vertical exhaust should be twice the horizontal run. Now if a good enough draft can be had with only eight feet or so of stovepipe then we are in business. Our greenhouse we are now building is 70 feet long. What I was thinking of doing is to have one or two of the 55 gallon barrel type rocket stoves inside the greenhouse, surrounding the barrels with some heat storage material like water or a water/stone mix to keep it warm overnight. But is this enough for the soil, I ask? If our ancestors' model could be replicated, that might be the best solution for our kind of folk. Thoughts? How-dy. I haven't come across anything yet as far as caring for newly hatched chicks. After our hen hatched seven chicks herself, the chicks that are 4 days old or so are in a small enclosure during the day with momma hen. We move the cage around so they get fresh forage every so often. Do we need to get additional feed for newbies? Is there some disease preventatives in the feed that mother nature doesn't provide? It seems to me that if they're foraging just like ma, they'll do just fine. Also, our two other adults at this time are not laying. Is this a sign of not getting enough forage or something? Our paddocks are quite large for the amount of chickens that we have. 3 adults, 4 adolescents, and 7 babies in paddocks that are 25 ft x 25 ft. Trying to get this all sorted out before I up and leave for Uganda in 2 1/2 weeks ops: Thanks!!! When making these lacto-fermented beverages, does one need to rack off the dregs? I made the Raspberry Drink from Nourishing Traditions, and it started out way too tart, but after a few days it has become wondrous. Just wondering if I should not be drinking the collecting dregs at the bottom. Thanks! So, I have gone ahead and made paddocks in the apple orchard, planted comfrey, nettles, jerusalem artichokes, and golden raspberries within. The paddocks are about 20 by 25 ft. or so, and there are 4 of them with 6 mature apple trees inside. We have 7 chickens in there and when we build a bigger coop, more. I am quite excited about this method, and thanks Paul and everyone else for all this great info!! I commented on the video, but didn't see a link to rate it... tried splitting tamarack, but the wood seems to always grow twisted so its use would be somewhat limited. It's a great species that has similar pest/weather resistance to cedar, and is generally much cheaper at the sawmill than cedar is. It does, however, tend to leave invisible splinters that fester.